For the ferry, see MS Knossos. 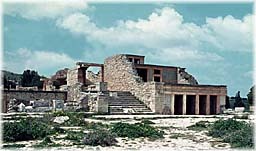 A portion of Arthur Evans' reconstruction of the Minoan palace at Knossos. This is Bastion A at the North Entrance, noted for the Bull Fresco above it. Knossos (alternative spellings Knossus, Cnossus, Greek Κνωσός pronounced [kno̞ˈso̞s]), also known as Labyrinth, or Knossos Palace, is the largest Bronze Age archaeological site on Crete and probably the ceremonial and political centre of the Minoan civilization and culture. The palace appears as a maze of workrooms, living spaces, and store rooms close to a central square. Detailed images of Cretan life in the late Bronze Age are provided by images on the walls of this palace. It is also a tourist destination today, as it is near the main city of Heraklion and has been substantially restored by archaeologist Arthur Evans. The city of Knossos remained important through the Classical and Roman periods, but its population shifted to the new town of Handaq (modern Heraklion) during the 9th century AD. By the 13th century, it was called Makryteikhos 'Long Wall'; the bishops of Gortyn continued to call themselves Bishops of Knossos until the 19th century. Today, the name is used only for the archaeological site situated in the suburbs of Heraklion. "Prince of lilies" or "Priest-king Relief", plaster relief at the end of the Corridor of Processions, restored by Gilliéron, believed by Arthur Evans to be a priest-king, wearing a crown with peacock feathers and a necklace with lilies on it, leading an unseen animal to sacrifice. The ruins at Knossos were discovered in 1878 by Minos Kalokairinos, a Cretan merchant and antiquarian. He conducted the first excavations at Kephala Hill, which brought to light part of the storage magazines in the west wing and a section of the west facade. After Kalokairinos, several people attempted to continue the work (and Heinrich Schliemann had previously showed an interest), but it was not until March 16, 1900 that archaeologist Sir Arthur Evans, an English gentleman of independent means, was able to purchase the entire site and conduct massive excavations. The excavation and restoration of Knossos, and the discovery of the culture he labeled Minoan, is inseparable from the individual Evans. Nowadays archaeology is a field of academic teamwork and scientific prestige, but a century ago a project could be driven by one wealthy and self-taught person. Assisted by Dr. Duncan Mackenzie, who had already distinguished himself by his excavations on the island of Melos, and Mr. Fyfe, the British School at Athens architect, Evans employed a large staff of local labourers as excavators and within a few months had uncovered a substantial portion of what he named the Palace of Minos. The term 'palace' may be misleading: in modern English, it usually refers to an elegant building used to house a head of state or similar. Knossos was an intricate collection of over 1000 interlocking rooms, some of which served as artisans' workrooms and food processing centres (e.g. wine presses). It served as a central storage point, and a religious and administrative centre. The throne room was repainted by a father-and-son team of artists, both named Émile Gilléron, at Arthur Evans' command. While Evans claimed to be basing the recreations on archaeological evidence, many of the most best-known frescoes from the throne room are almost complete inventions of the Gillérons. The site has had a very long history of human habitation, beginning with the founding of the first Neolithic settlement circa 7000 BC. Over time and during several different phases that had their own social dynamic, Knossos grew until, by the 19th to 16th centuries BC (during the 'Old Palace' and the succeeding 'Neo-palatial' periods), the settlement possessed not only a monumental administrative and religious center (i.e., the Palace), but also a surrounding population of 5000-8000 people. The palace is about 130 meters on a side and since the Roman period has been suggested as the source of the myth of the Labyrinth, an elaborate mazelike structure constructed for King Minos of Crete and designed by the legendary artificer Daedalus to hold the Minotaur, a creature that was half man and half bull and was eventually killed by the Athenian hero Theseus. Labyrinth may have come from labrys, a Lydian word referring to a double, or two-bladed, axe. Its representation had religious and probably magical significance. It was used throughout the Mycenaean world as an apotropaic symbol, that is, the presence of the symbol on an object would prevent it from being "killed". Axes were scratched on many of the stones of the palace. It appears in pottery decoration and is a motif of the Shrine of the Double Axes at the palace, as well as of many shrines throughout Crete and the Aegean. The first written attestation of the word 'labyrinth' is believed by many linguists to feature on a Linear B tablet as da-pu2-ri-to-jo po-ti-ni-ja, 'lady of the Labyrinth', which makes the etymology connecting it to labrys less likely. Whatever the word's ultimate origin, it must have been borrowed into Greek, as the suffix labyr-inthos uses a suffix generally considered to be pre-Greek. The location of the labyrinth of legend has long been a question for Minoan studies. It might have been the name of the palace or of some portion of the palace. Throughout most of the 20th century the intimations of human sacrifice in the myth puzzled Bronze Age scholars, because evidence for human sacrifice on Crete had never been discovered and so it was vigorously denied. The practice was finally confirmed archaeologically (see under Minoan civilization). It is possible that the palace was a great sacrificial center and could have been named the Labyrinth. Its layout certainly is labyrinthine, in the sense of intricate and confusing. Many other possibilities have been suggested. The modern meaning of labyrinth as a twisting maze is based on the myth. Several out-of-epoch advances in the construction of the palace are thought to have originated the myth of Atlantis. Magazine 4 with giant pithoi. The compartments in the floor were for grain and produce. An alternative explanation for these compartments is that they were catch basins for the contents of the pithoi if one should break or leak. It would be very hazardous to store grain or produce in the floor of a magazine, the main purpose of which was to hold giant vases of liquids. The great palace was built gradually between 1700 and 1400 BC, with periodic rebuildings after destruction. Structures preceded it on Kephala hill. The features currently most visible date mainly to the last period of habitation, which Evans termed Late Minoan. The palace has an interesting layout - the original plan can no longer be seen because of the subsequent modifications. The 1300 rooms are connected with corridors of varying sizes and direction, which is different than other palaces of the time period which connected the rooms via several main hallways. The 6 acres (24,000 m2) of the palace included a theatre, a main entrance on each of its four cardinal faces, and extensive storerooms (also called magazines). The storerooms contained pithoi (large clay vases) that held oil, grains, dried fish, beans, and olives. Many of the items were created at the palace itself, which had grain mills, oil presses, and wine presses. Beneath the pithoi were stone holes used to store more valuable objects, such as gold. The palace used advanced architectural techniques: for example, part of it was built up to five storeys high. The palace had at least three separate liquid management systems, one for supply, one for drainage of runoff, and one for drainage of waste water. Aqueducts brought fresh water to Kephala hill from springs at Archanes, about 10 km away. Springs there are the source of the Kairatos river, in the valley of which Kephala is located. The aqueduct branched to the palace and to the town. Water was distributed at the palace by gravity feed through terracotta pipes to fountains and spigots. The pipes were tapered at one end to make a pressure fit, with rope for sealing. The water supply system would have been manifestly easy to attack. No hidden springs have been discovered as at Mycenae. Sanitation drainage was through a closed system leading to a sewer apart from the hill. The Queen's Megaron contained an example of the first water flushing system toilet adjoining the bathroom. This toilet was a seat over a drain flushed by pouring water from a jug. The bathtub located in the adjoining bathroom similarly had to be filled by someone heating, carrying, and pouring water, and must have been drained by overturning into a floor drain or by bailing. This toilet and bathtub were exceptional structures within the 1300-room complex. As the hill was periodically drenched by torrential rains, a runoff system was a necessity. It began with channels in the flat surfaces, which were zig-zag and contained catchment basins to control the water velocity. Probably the upper system was open. Manholes provided access to parts that were covered. Some links to photographs of parts of the water collection management system follow. Due to its placement on the hill, the palace received sea breezes during the summer. It had porticoes and airshafts. The palace also includes the Minoan Column, a structure notably different from other Greek columns. Unlike the stone columns characteristic of other Greek architecture, the Minoan column was constructed from the trunk of a cypress tree, common to the Mediterranean. While most Greek columns are smaller at the top and wider at the bottom to create the illusion of greater height, the Minoan columns are smaller at the bottom and wider at the top, a result of inverting the cypress trunk to prevent sprouting once in place. The columns at the Palace of Minos were painted red and mounted on stone bases with round, pillow-like capitals. Frescoes decorated the walls. As the remains were only fragments, fresco reconstruction and placement by the artist Piet de Jong is not without controversy. These sophisticated, colorful paintings portray a society which, in comparison to the roughly contemporaneous art of Middle and New Kingdom Egypt, was either conspicuously non-militaristic or did not choose to portray military themes anywhere in their art. (See Minoan civilisation) One remarkable feature of their art is the colour-coding of the sexes: the men are depicted with ruddy skin, the women as milky white. Almost all their pictures are of young or ageless adults, with few children or elders depicted. In addition to scenes of men and women linked to activities such as fishing and flower gathering, the murals also portray athletic feats. The most notable of these is bull-leaping, in which an athlete grasps the bull's horns and vaults over the animal's back. The question remains as to whether this activity was a religious ritual, possibly a sacrificial activity, or a sport, perhaps a form of bullfighting. Many people have questioned if this activity is even possible; the fresco might represent a mythological dance with the Great Bull. The most famous example is the Toreador Fresco, painted around 1550-1450 BC, in which a young man, flanked by two women, apparently leaps onto and over a charging bull's back. It is now located in the Archaeological Museum of Herakleion in Crete. 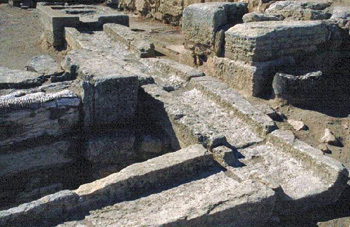 The centerpiece of the "Mycenaean" palace was the so-called Throne Room or Little Throne Room, dated to LM II. This chamber has an alabaster seat identified by Evans as a "throne" built into the north wall. On three sides of the room are gypsum benches. A sort of tub area is opposite the throne, behind the benches, termed a lustral basin, meaning that Evans and his team saw it as a place for ceremonial purification. The room was accessed from an anteroom through two double doors. The anteroom in turn connected to the central court, which was four broad steps up through four doors. The anteroom had gypsum benches also, with carbonized remains between two of them thought to be a possible wooden throne. Both rooms are located in the ceremonial complex on the west of the central court. The throne is flanked by the Griffin Fresco, with two griffins couchant (lying down) facing the throne, one on either side. Griffins were important mythological creatures, also appearing on seal rings, which were used to stamp the identity of the bearer into pliable material, such as clay or wax. The seat of a priest-king or his consort, the queen. This is the older theory, originating with Evans. In that regard Matz speaks of the "heraldic arrangement" of the griffins, meaning that they are more formal and monumental than previous Minoan decorative styles. In this theory, the Mycenaean Greeks would have held court in this room, as they came to power in Knossos at about 1450. The "lustral basin" and the location of the room in a sanctuary complex cannot be ignored; hence, "priest-king." The lustral basin was originally thought to have had a ritual washing use, but the lack of drainage has more recently brought some scholars to doubt this theory. It is now speculated that the tank was used as an aquarium. A long-standing debate between archaeologists concerns the main function of the palace, whether it acted primarily as an administrative center, a religious center—or both, in a theocratic manner. Other important debates consider the role of Knossos in the administration of Bronze Age Crete, and whether Knossos acted as the primary center, or was on equal footing with the several other contemporary palaces that have been discovered on Crete. Many of these palaces were destroyed and abandoned in the early part of the 15th century BC, possibly by the Mycenaeans, although Knossos remained in use until destroyed by fire about one hundred years later. It is worth noting that Knossos showed no signs of being a military site; no fortifications or stores of weapons, for example. The Palace of Knossos was selected as the main motif of a recent commemorative coin, the Greek €100 Palace of Knossos commemorative coin, minted in 2003. This coin was issued in a series of coins celebrating the 2004 Summer Olympics. On the obverse, a view of a restoration of part of the palace can be seen. ^ Oliver Rackham and Jennifer Moody (1996). The Making of the Cretan Landscape. Manchester University Press. pp. g. 94, 104. ISBN 0-7190-3646-1. ^ Gere, Cathy Knossos and the Prophets of Modernism (Chicago: The University of Chicago Press, 2009), 111. ^ Matz, The Art of Crete and Early Greece, uses this term. CALENDAR HOUSE: Secrets of Time, Life & Power in Ancient Crete's Great Year. 2007: researched/written/published (CD) by Dr. Jack Dempsey. British School at Athens Knossos Pages. This site contains an Activex tour with moving panoramas through the palace. Heraklion (Greek Ηράκλειο, also transliterated as Heraklio, Iraklion or Irakleio)  is the major city and capital of the largest Greek island of Crete. Its Archaeological Museum holds the remains of the 3000-year old Minoan civilization, which grew aroud the nearby legendary palace of Knossos (of Minotaur fame), as well as Byzantine churches and a well-preserved Venetian wall and fortress from the 15th century. Heraklion (or Herakleion, Iraklio, Irakleion) is the capital of Crete and an industrialised city of around 155,000 residents. The modern city has been disfigured by a lack of any comprehensive planning or any serious commitment to preservation, which has resulted in a traffic-choked urban horror overlaying historical remains of potentially immense interest, but the knowledgeable visitor will still be able to trace the past under the ugly urban sprawl of the present. However, in recent years, things have began to change and efforts are being made to bring out the beauty of the city's rich cultural history. The core of the city is still enclosed and defined by the Venetian wall, which includes seven outjutting bastions. In the southernmost of these, the Martinengo Bastion, is the grave of Nikos Kazantzakis, standing on a windswept hilltop with its moving inscription, "I hope for nothing. I fear nothing. I am free." Heraklion has a Mediterranean climate. Summers are hot and dry with clear skies. Dry hot days are often relieved by a system of seasonal breezes. Winters are mild with relatively little rain and rare frosts. Current weather conditions can be found here: . Located in the middle of the island, all roads lead to Heraklion. Heraklion has a busy harbour and very busy airport and usually is the starting point of travels to Crete and nearby islands. Olympic Airways and Aegean Airlines fly in from Athens and other major Greek cities. The recently established Athens Airways also connects Heraklion with Athens. During summer, Sky Express  flies to several Aegean islands. Heraklion is connected with the rest of Crete by regular bus lines operated by two KTEL companies , . The coaches are modern, comfortable and air-conditioned. Fare is reasonable. There are ferries from Athens (Piraeus) to Heraklion, Minoan Lines  , Anek Lines  and Superfast Ferries  - and also there are normal ferries from Thessaloniki and Dodecanese - G.A. Ferries  , and Highspeed Catamarans and normal ferries from Cyclades to Heraklion. G.A. Ferries  , Sea Jets  , Santorini Maritime  and Hellenic Seaways . The frequency is reduced in the winter. You can use public city bus network to get around Heraklion but you have to figure out the line to your destination. There are usually no routes or schedules posted at the bus stops. Buses do not stop at bus stops, unless you signal the driver by raising your arm. Basic ticket costs 0,90 €. Line 1 goes to/from the airport. Line 2 takes you to/from Knossos. The Minoan Palace of Knossos tel: +30 2810 231940, +30 2810 226470, +30 2810 226092, +30 2810 224630 fax: +30 2810 241515 protocol@kgepka.culture.gr. Full ticket: €6, Reduced: €3; Special ticket package: Full: €10, Reduced: €5, valid for: Heraklion Archaeological Museum and Knossos Site, Open Winter: Daily 08.30-15.00 Summer: 08.00-19.30. ] Knossos (Greek Κνωσός, the accent is on the second syllable) is the site of the most important and best known Minoan palace complex in Crete. It is located some 5 km (3 mi) south of Heraklion. According to tradition, Knossos was the seat of the legendary Cretan king Minos. The Palace is also connected with further legends, such as the myth of the Labyrinth and the Minotaur, as well as the story of Daidalos and Ikaros. Excavation has revealed that the site was continuously inhabited from the Neolithic period (7000-3000 B.C.) until Roman times. Museum of the Battle for Crete and National Resistance Recounts the tale of Cretan and Allied resistance against Nazi invaders in World War II. Museum of Natural History, University of Crete, S. Venizelou Ave., Tel./Fax: +30 2810 324366,. Historical Museum of Crete, 27, Sofokli Venizelou Ave. /7, Lysimachou Kalokerinou St., Tel: (++30) 2810 283219, 288708, . Lychnostatis open-air Cretan folklore museum, Tel: +3028970-23660, . Su-F 9AM-2PM. €4,50. CretAquarium Thalassocosmos open June -September 09:00-21:00 October-May 09:00-19:00 tel Reception: +30 2810-337788 Bookings: +30 2810-337888, fax: +30 2810-337882 , the biggest aquarium in the Eastern Mediterranean. Located about nine miles east of Heraklion on the National Road (signposted) or by Cretan Intercity Bus (tel +30 2810 246530); for more information call the Reception number, above. Nikos Kazantzakis Museum . Open daily from 9AM-7PM (Mar-Oct); 10AM-3PM (Nov-Feb), €3, tel +30 2810-741689, in the village of Myrtia (Varvari) 15 km. south of Heraklion, directions on the museum's web site  focuses on Crete's most prominent modern intellectual figure. Amoudara the city's beach area; a three kilometer strip of sandy beach, lots of cafes, bars and hotels and the site of "Technopolis", a modern multiplex cinema and open-air theatre. Horseback riding, experienced and amateur riders can ride at the beach of Karteros, or take riding lessons at Ippikos Omilos Hrakliou, located 6km east of Heraklion, in Karteros. Rock Climbing, localers and visitors can climb on a 50 foot rock at the suburb of Karteros, east of Heraklion. Safety equipment is provided, but one can use his own gear too. Water fun, at the nearby Water City and Aqua Plus water parks. The University of Crete  is the leading higher education institution on the island of Crete. The University was established in 1973 and operates under the supervision of the State. The seat of the University is in Rethymno, with Heraklion hosting the School of Sciences and Engineering and that of Health Sciences. Visit the central open market in Meidani square and buy mountain herbs, spices and folk natural remedies. Heraklion Sailing Club (Greek: Istioploikos or Ιστιοπλοϊκός) Heraklion Harbour, GR-71262 Heraklion. Tel: 0030 2810 22 8118 Classic seafood restaurant facing the Venetian Castle, beloved by Heraklion's locals. Specialities include charcoal grilled fish, seafood salads, clams, and the award winning mussel risotto. Located in the harbour and opposite the Venezian castle (Koules)in the former premises of the port refrigeration plant, east of the Port Authority. Sailing Club membership is not required for the restaurant. Pagopieion (Ice-Factory) is a "quirky", very different restaurant and cafe/bar, at St Titus square, by the church. You can sit outside and enjoy the setting, or you might be tempted by the dramatic decor to sit inside. Either way, the food is excellent, the menu different and interesting - Mediterranean with a twist. Good fish too. Raki, also known as Tsikoudia, is the the trademark of Cretan day and night life, a strong clear drink similar to Grappa in Italy or Orujo in Spain. It is made out of the 'must' of grape skins and twigs after the local production of the white wine. It doesn't taste like aniseed, as opposed to the Turkish raki. Most raki is 80 proof, about the strength of most vodkas, but some are much stronger. It's often served in small glasses after dinner with a plate of fruit or other dessert. Cretan Wine: Try the distinctive Cretan wine, produced in the island for at least 4000 years. Labels: Sitia, Peza Union. The Cretans themselves drink so called 'open' wine, straight out of the barrel, like fresh white wine, and the sometimes very old dark rusty red wine, a bit like port. There are not many hostels available in Heraklion, but if one searches hard he can find a couple of them. Both are situated in the city centre, only a 10' drive from the airport and a 5' drive from the port. One can go there by taxi. Most taxi drivers know where these hostels are. Actually, I can't think of a better way to find them. The taxi fare from the airport to the hostels at the city centre should cost less than 10 euros, and from the port less than 6 euros. walking distance to port; very close to bus station to catch bus to Knossos Palace, as well as other cities in Crete. Walk down Ethn. Antistaseos Ave from the Port, when you see McDonald's, make a left. Hotel will be on your right. Mirabello Hotel . Very centrally situated in a quiet corner of the city. An archaeological site on the island of Crete. Knossos on Wikimapia - Wikimapia - Let's describe the whole world!